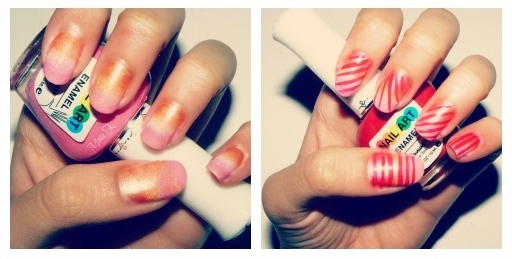 Day1 – Red Nails: Not all of it is red obviously (A). but most of it is so yeahh. 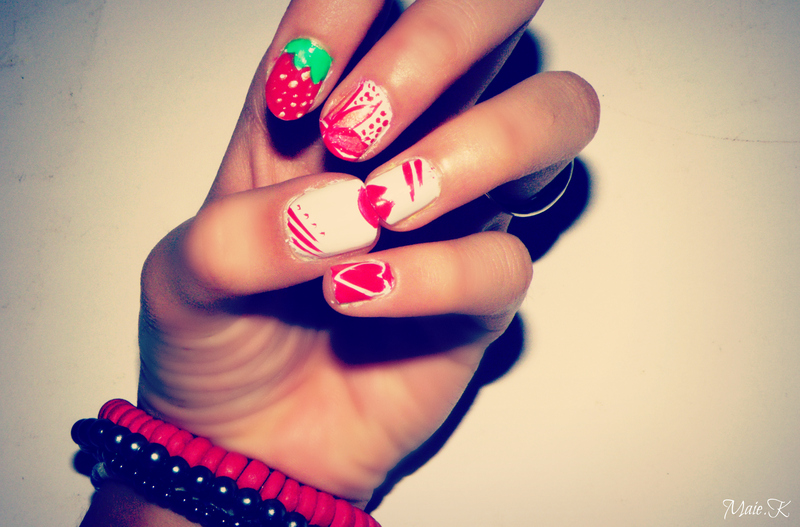 Starting From the left; Heart, Red Lips, A Fail Flower, and a strawberry. 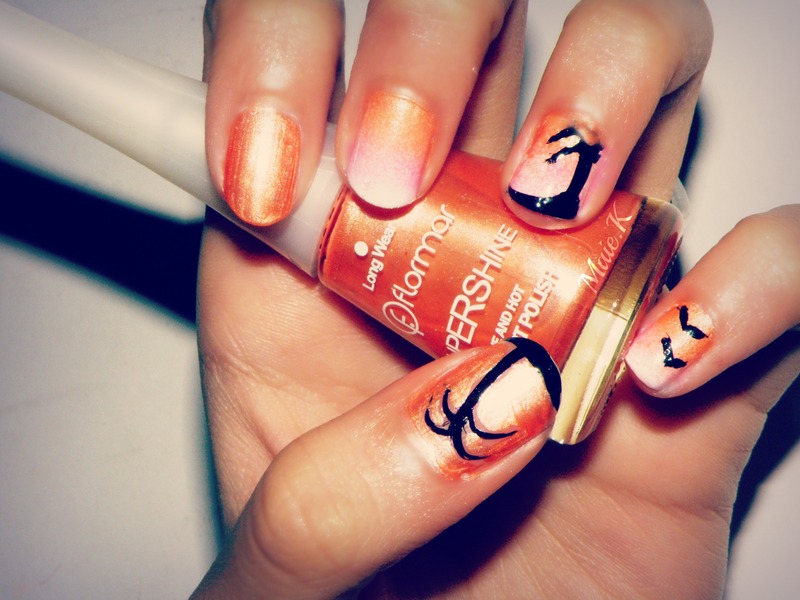 Day2 – Orange Nails: The theme that I was thinking of for this one was supposed to be a nice sunset scene but nooo it looks like a Halloween design! 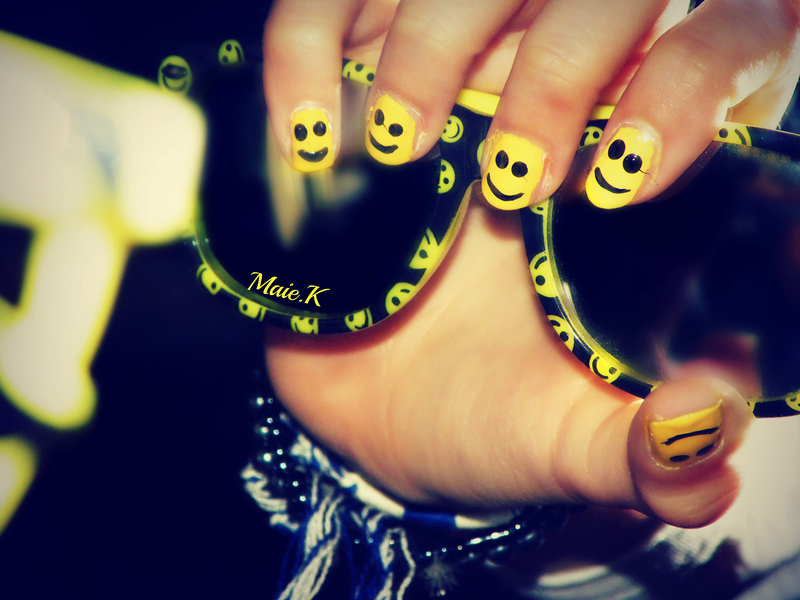 Day3 – Yellow Nails: I call these “The Happy Nails“. So easy, simple and happy 🙂 . 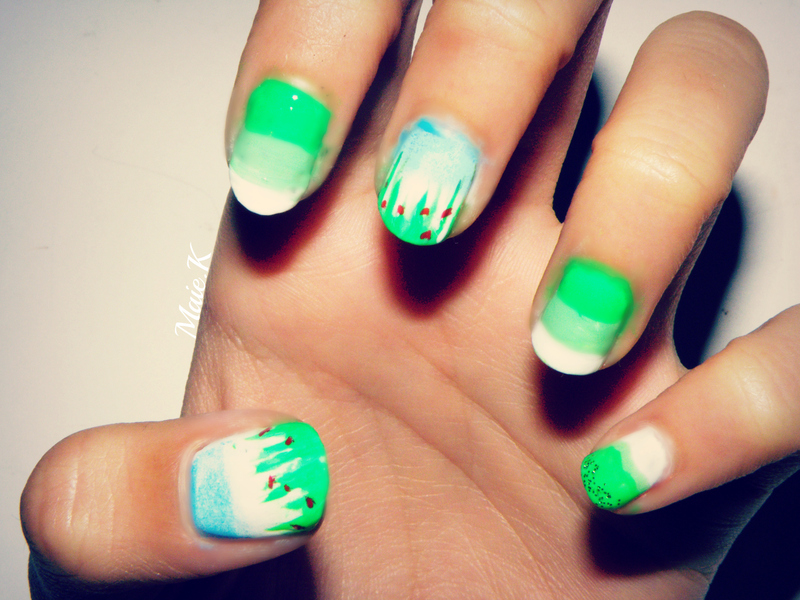 Day4 – Green Nails: Up till now this is my favourite! 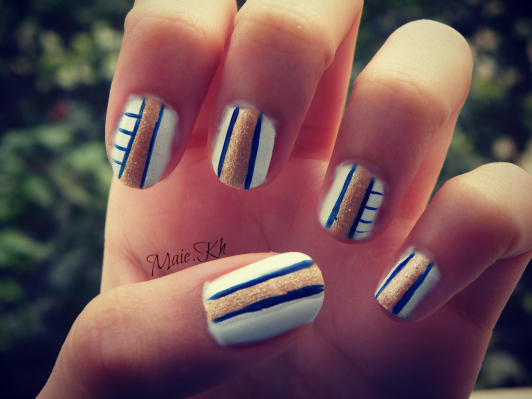 I think I’m actually going to do a tutorial for this since noone has this idea yet (6) ! Staring From My Pinkie; Well It’s basically different shades of green and some glitter at the bottom. 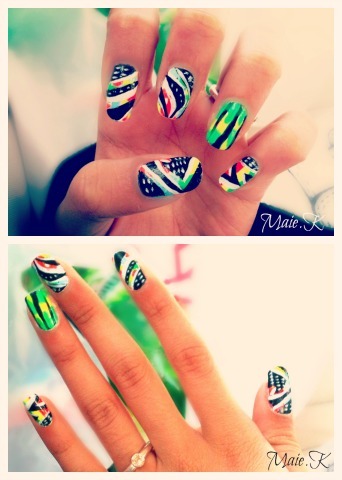 I love the next one, it’s like a green french nail thingg I Love It! After that is basically a blue sky with grass and the red dots are supposed to be flowers.. My mom thought it was a volcano .. Thanks mom .. But she has her excuse she was looking at them when the lights were off and only the lamp was on . Mhmm . 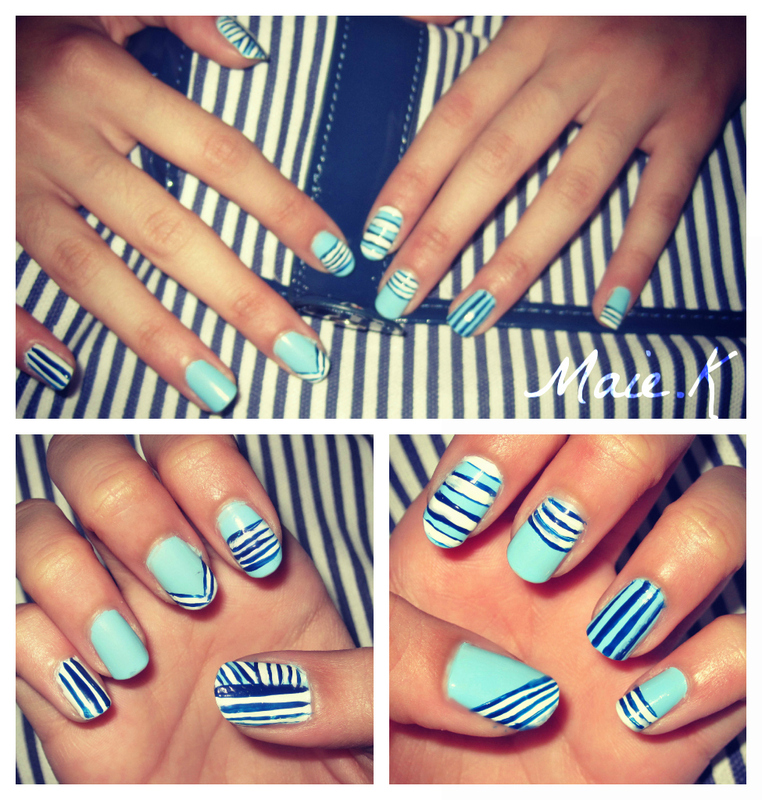 Day5 – Blue Nails: Ok this one definitely beats the green nails ^ . Or at least that’s my opinion. This is my favourite & will probably stay my favourite because it has a meaning behind it. 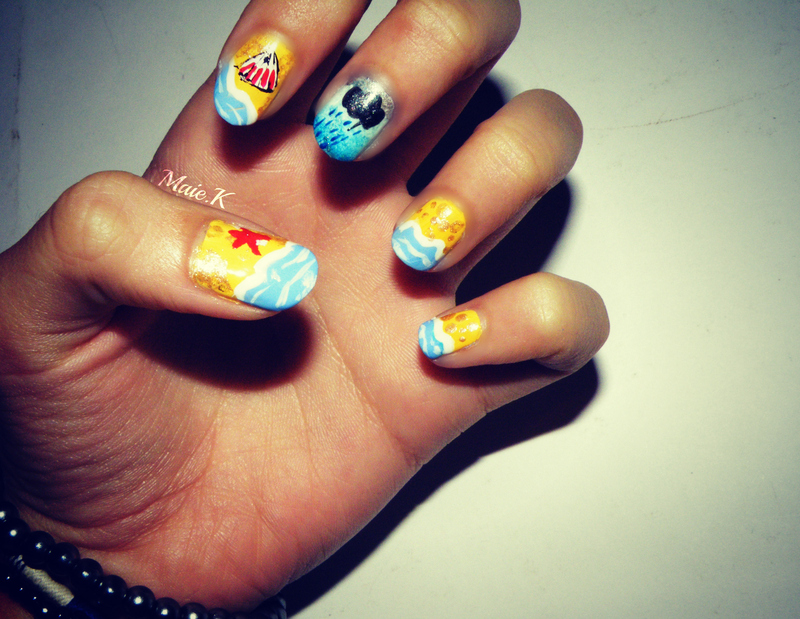 As you can see all of my nails are summery/Beach excluding my middle finger. My middle finger is a rainy/stormy and depressing day. so what’s the meaning? Just because today is a really horrible day doesn’t mean the sun isn’t going to shine in the rest 🙂 . 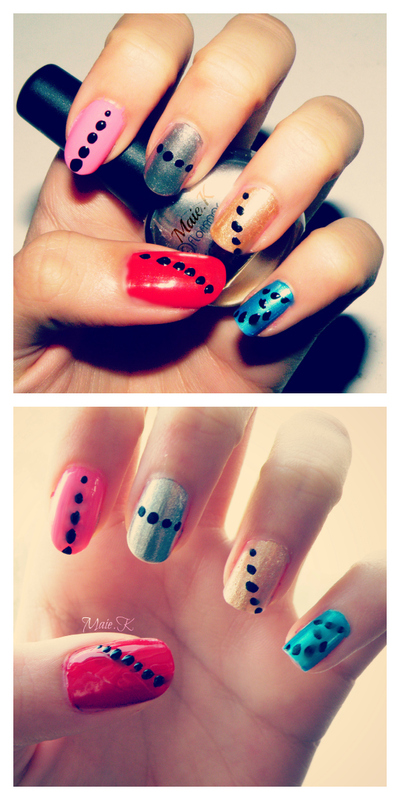 Staring From My Pinkie; Beach & sand for the first 2. Then clouds and rain, after that beach/sand and the red and white thing is a SHELL. Mama thought it said “Allah” in Arabic,Don’t know how the hell she saw that 0.0 and finally my thumb beach/sand and a red starfish. 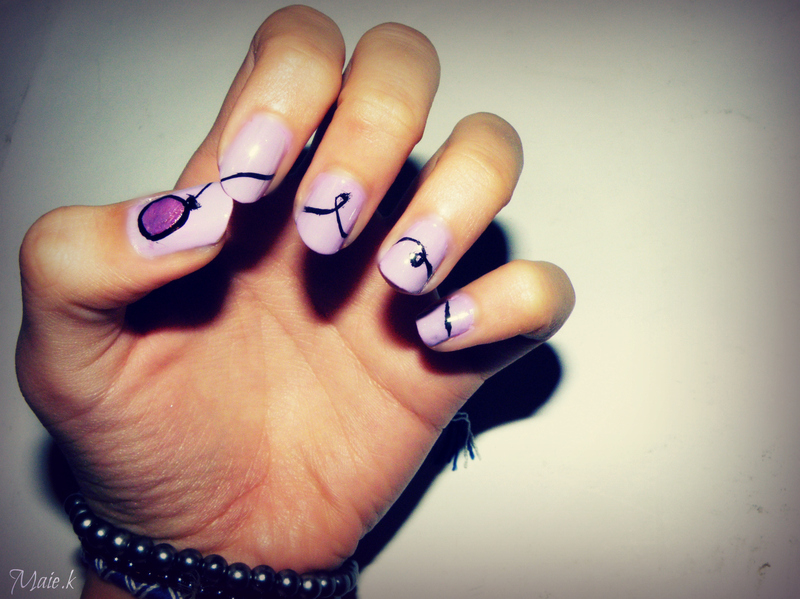 Day6 – Violet Nails: A Purple Balloon! Not as creative as the rest but not too simple either. Loving the background colour of my nails the “light purple”. Such a calm colour. The balloon idea was actually from my friends Asalah&Maya ♥. 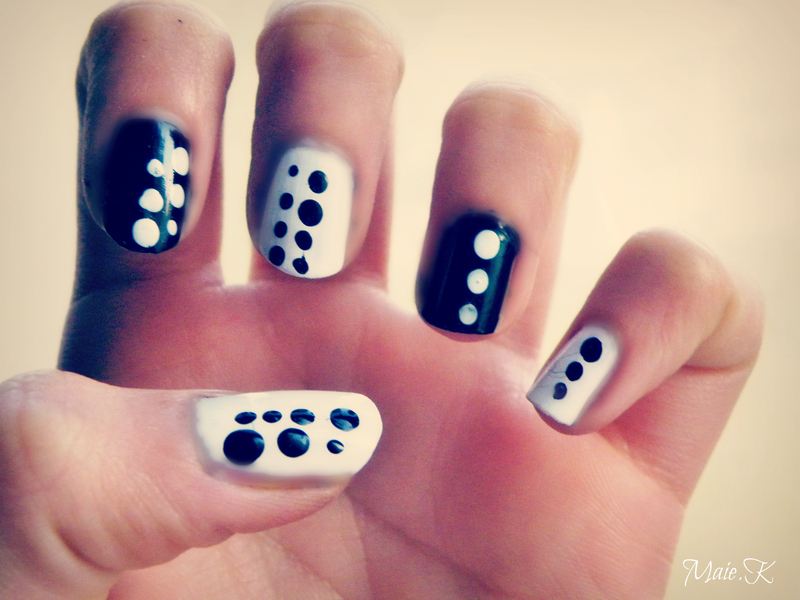 Day7 – Black & White Nails: Circle Circle Dot Dot AHA. 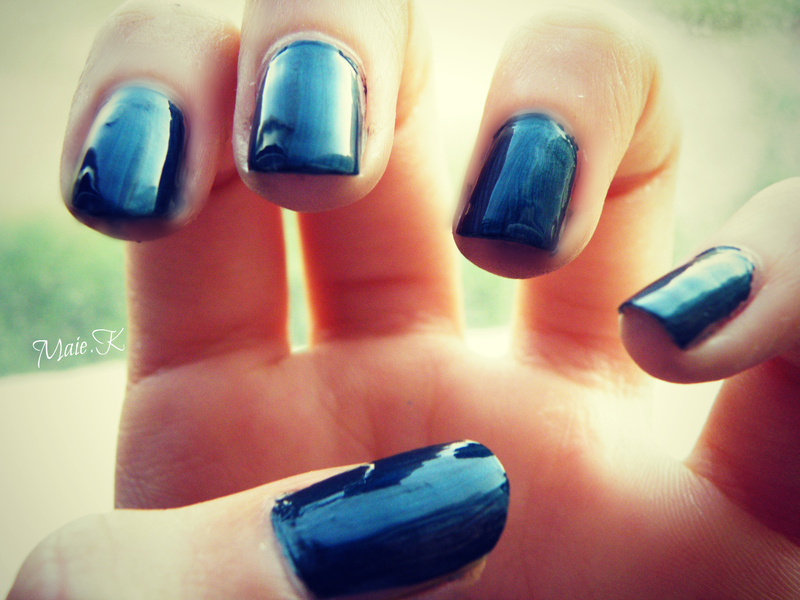 Day8 – Metallic Nails: I know they’re not exactly Metallic but that’s the closest nail polish I have! 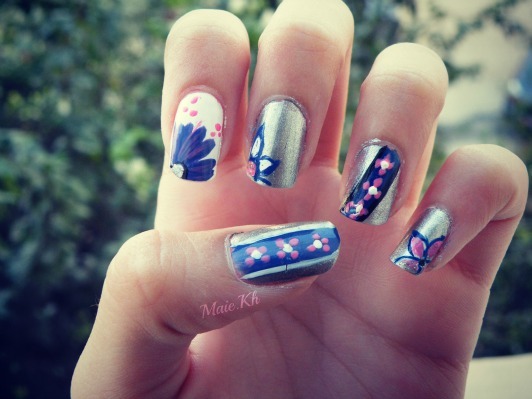 Day14 – Flowers: The Colours are very elegant I Like it. Day 15 – Delicate Printing: Simple yet effective. I really like it. At first I wasn’t sure if I like it or if I should change it.The gold makes it seem very delicate. 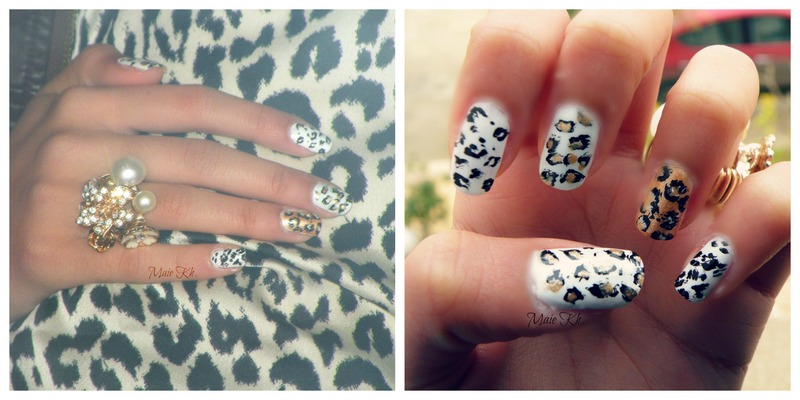 Day 16 -Tribal Print: It doesn’t really have a Tribal Print. However, It sure has Tribal Colours! 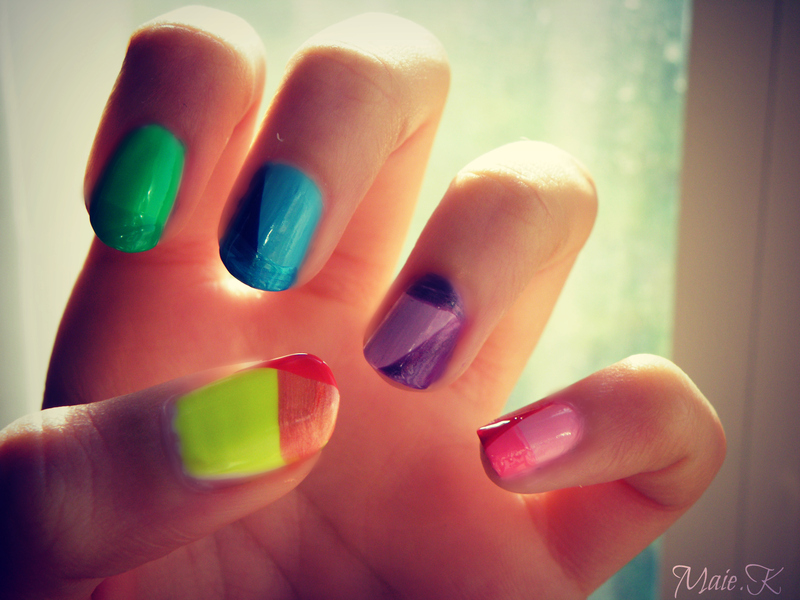 It’s so funky and colourful and seems creative. 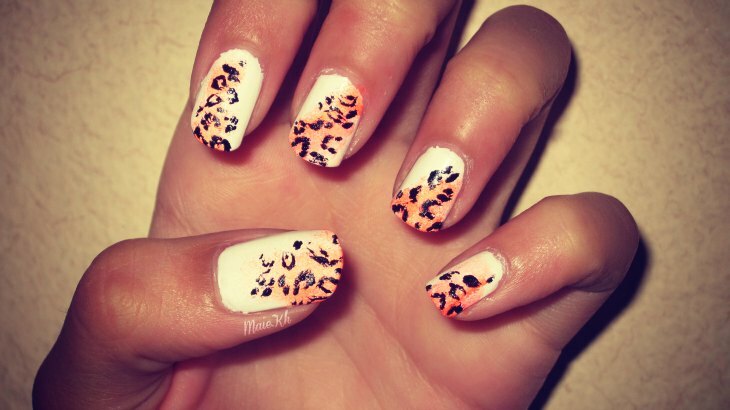 I recieved alot of compliments when I painted them on. 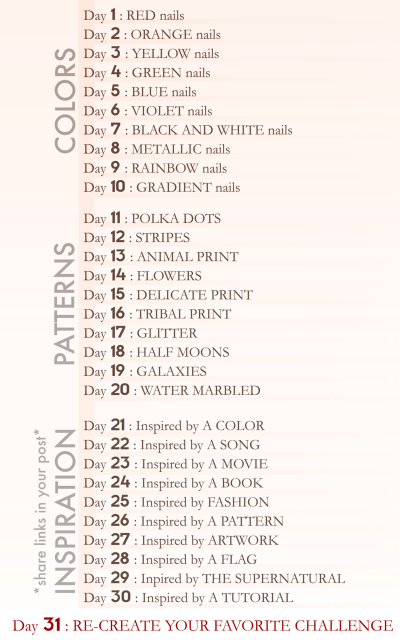 Day 17 – Glitter: Coming soon..
Day 18 – Half Moons: I love love love this colour. It’s bluey/Purplish colour. Silver really compliments it.